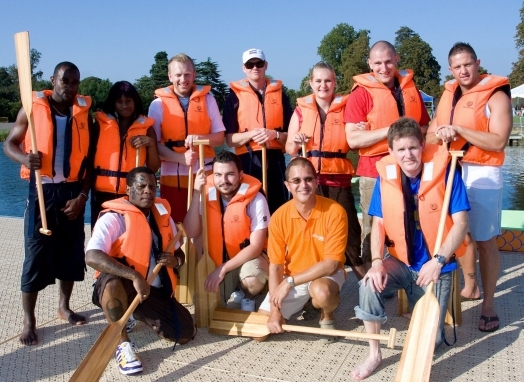 Whatever the focus of your team building event, SN2R Ltd will tailor-make the activity to deliver the objectives you want to achieve, making the experience immersive and fun. Team building is all about interaction and engagement so our aim is to work with you to deliver a fun experience for your staff, whether it is to motivate, improve performance, boost morale or to reward them. 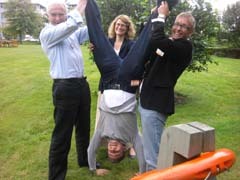 Please contact us to find out more about SN2R’s team building events. Teams are challenged and entertained with hi-tech missions that are carried out in their surrounding environment, wherever that may be - in the UK or internationally. The digital handset device is pre-programmed with missions and challenges and the teams typically have the time given to accomplish their tasks. All missions include an interactive quiz that keeps the team members active throughout the challenge. Each team is equipped with a pre-programmed handset that is used to receive instructions, send answers and take pictures. The technology enables instant feedback to be created and true unpredictability to be simulated, which makes for a greatly enhanced teambuilding experience. The City Shakers treasure hunt is themed around cocktails, and this team building event culminates in a fantastic group cocktail shaking session. 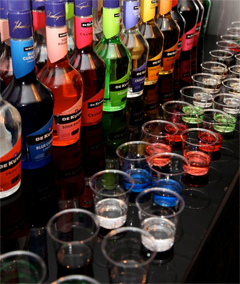 Your teams collect everything you need on the treasure hunt for your own exotic team cocktail - alcoholic or non-alcoholic depending on your people on your event. 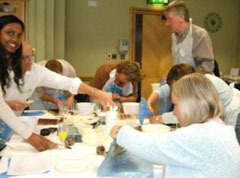 A qualified chocolatier will give your group an introduction to the history of chocolate production which will involve tasting a few samples, and a demonstration of how to produce and decorate the perfect chocolate. Then it'll be your turn to make some delicious sweets from the chocolate, fudge and praline provided with the help of the chocolatier and assistants. The proof of the chocolate is in the eating, and the team building event will conclude with the all-important taste test. Swordfighting provides an alternative event for executives who wish to challenge both their mind and body. It offers a unique opportunity to experience an unusual activity, with numerous individual and team outcomes. 'Get the point' sessions are fun. 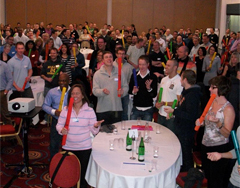 They energise your team and create a memorable event that will reinvigorate your team's goals. Groups from 2 to 200 can be catered for. 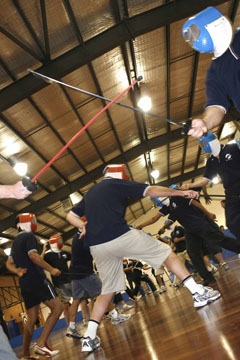 Fencing and swordfighting sessions can be held at your office or offsite location. Alternatively, either an indoor or outside location can be provided. Specially designed, unbreakable polymer swords are provided and instruction is from internationally experienced, qualified coaches. 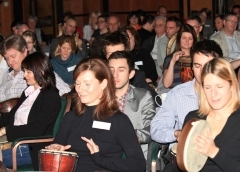 Drumming team building events will effortlessly transform your team into a drumming orchestra that will support, inspire and ultimately lead itself. You choose the team building activities that best suit you and we will arrange the rest - all you need to do is bring your team. 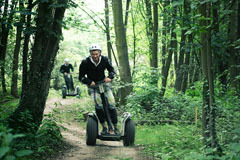 We have a vast range of unique fun activities exclusively for your team to enjoy. Working with video cameras, props and a free reign, your challenge is to produce a hard hitting, attention grabbing, and entertaining film. Your first task is to draw a mystery envelope containing your team's film style. You will be given hi-tech video camera equipment with a branded team pack offering hints on storylines and script writing, camera angles and technical equipment. Around the room are make-up stations offering wigs, make-up, fake moustaches and various pairs of glasses - everything you may need to make that silver screen transformation! The climax of the event occurs when you attend your very own Cannes Film Festival. The festival incorporates a mini awards ceremony with accolades available for categories such as 'Best Actor', 'Best Action Scene' and 'Best Actor in a Cross Gender Role'. The objective is for the group to work as a whole to complete a giant 3D working sculpture. Because the activity involves solving puzzles using many different disciplines, creating costumes and constructing model sculptures it appeals to the widest range of participants. The key is for all these people to use their individual skills to come together successfully as one big team. Finally the sculptures are set in motion to recount the story like a sophisticated giant game of "mousetrap" or "dominoes". The dramatic finale reveals the answer everyone is looking for. 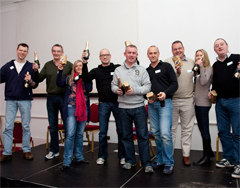 The Different Class team building activity is a fun corporate team building event designed to give your teams the chance to go back to school for a day and have a laugh together. Will your team rise to the challenge of the theories of physics or will they blow up the chemistry lab? Your meeting room is transformed into a school hall and teams are seated in their own school 'house'. Each class will accumulate as many house points as possible during the different classes which are all different team building exercises. The team with the most points at the end of the day's team building will win the school cup. Dino Dash is based on the Royal Tournament Field Gun race. Each team is tasked with racing their Dinosaur through an assault course – but first it must be constructed. The dinosaur is made up of a series of component parts. Each brightly coloured piece of the jigsaw is slotted together in a logical way. The assault course will challenge the teams in a variety of ways as you race to cross the finishing line first. Dino Dash can be brought to your office or to the conference centre or hotel where you are having your event. In the Rat Trap team activity your group builds a giant model together to work in a chain reaction like the classic board game "Mousetrap". 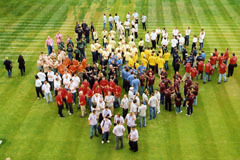 Teams of 6 – 8 participants concentrate on their own part of the model that they must design and at the end each team fits their model together with their colleagues’ models to trap the rat. The Rat Trap game works well at most venues because it is very versatile with the space it uses and it can be indoors or outdoors in the summer. It’s also very flexible time-wise and can last from 45 minutes to 2 hours according to what you want to achieve. This game is designed to promote communication and inspire creativity. Your teams will be assigned a design kit which includes a few basic building materials. Using their imagination and ingenuity the teams need to build their very own model – for example, an airship which is capable of flying high above the meeting room in a race at the end of your activity. Teams gather together and brainstorm ideas. This is where careful role allocation will really come into its own. Roles include the project manager, the foreman, the designers and the builders. Time is normally tight with this activity so time management skills and sharp communication skills are important to get the job done successfully. Team Work of Art brings people together to create a giant work of art from a series of blank canvasses. The game allows them to get to know each other in a fun and social way without common workplace politics and competition getting in the way. Everyone gets involved because there’s much more to it than just painting and the dramatic unveiling of your Team Work of Art at the end gives you something real to keep that your whole team is really proud of. 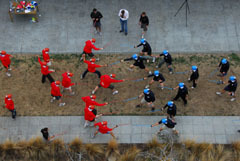 This team building activity requires your team to work together to undertake the 12 tasks completed by Hercules. Each task has been specially designed by a different God and will challenge your team in different ways through the different activities. Challenges will range from practical, hands-on design and building tasks to creative, visual and problem-solving activities giving everyone the opportunity to shine. In the finale set by Zeus – God of Gods – your team will come together to find out just how much you know about your team mates, how well you’ve worked together and how well you know each other. The catwalk is lit up, the music is playing and the technicians have done their last sound check... there is a problem. No models and no designer clothes! The challenge is to save the show by designing and creating your own What NOT to Wear Collection! Working as a team you will be given a limited wardrobe of fabrics and accessories. In addition to the costume design you will be performing all the roles it takes to get the show on the road. Once you have named your fashion house, you will have to think on your feet and deliver the challenge. The Mole is a 'top secret' corporate team building. The aim is to reveal the identity of The Mole. You will be part of a team of covert investigators united as you face the challenges to unravel a case hampered by red herrings and dead ends. Riddles and puzzles, questions and realisations weave through the event. A frantic 'head to head' race between the teams to unravel the mystery and submit their deduction as to who is The Mole will then ensue. The deductions are then read out in an exciting finale.